The link on the right will take you to the download page on payloadz. The Meditation Orb, is a modest $5.99. This is a one-time fee. There are no in-game fees or charges. CLEAR LIGHT -- Strictly MetaProgramming MetaTool, this is used for all sorts of functional spiritual remedial actions, mostly with recently deceased. Besides the ABD, this is the primary tool of the LRS. Anyone that has run an Orb from UrthGame.com can attest to the effectiveness of running these orbs as a spiritual practice. Something that you might not be aware of is how effective they can be when used on behalf of another. Yes, it is possible to do a "Reading" by running a Prosperity Path Orb for the voyager. After the orb has finished loading, press the letter P on the keyboard. Type the name of the person that you would like to run for. When you have finished typing the letters in the name, press the Enter key on your keyboard. Yes, you are invited to help with the amazing service of running orbs for the benefit of others. A dedicated guide can be anyone who cares enough to assist a loved one or even a stranger through transition. If you are ready to get started, download this Orb and start running it -- for yourself, for others. And, if you'd like more information take a look at the information on TheClearLight.com. 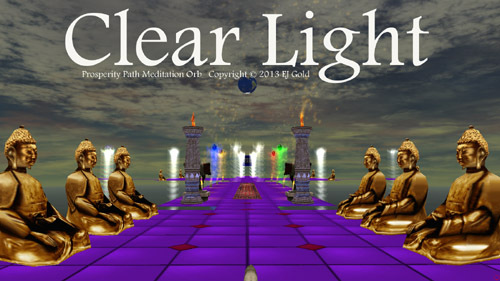 Thank you,really thank you for Clear Light video game meditation. I feel inner peace and happy.